Mini served her first detention yesterday. This girl cannot get to school on time. The other day I called the school to alert them that she would be late - yet again. She wanted me to drive her. I refused to load three toddlers into car seats to drop her at school four blocks away. Apparently, I don't wake her up early enough. Her mother makes her lunch and her breakfast. It sounds like I am enabling her. This might be true, but I will do ANYTHING in order that she gets a few more minutes sleep. She often goes to bed later than ideal because of Irish dancing class and homework. My assistance in prepping her breakfast and packing her lunch leave her with only a few things to accomplish each morning. Mini is solely responsible to shower, get dressed, and eat. I believe that 45 minutes is ample time to prepare for the day, particularly because Mini does not spend any time styling her hair. She brushes it after her shower and leaves the house with it wet. Often it's in a pony tail. And, she doesn't wear makeup yet. (I shudder to think of the morning routine once she enters high school - not to mention . . . high school starts earlier than junior high). I hung up with this same secretary the other morning and shared with Mini that the woman apologized, but wanted me to know that the gig was up. Mini would now need to serve a detention. The school had already shown her a great deal of leniency. I almost doubled over laughing when she explained that each student is only supposed to receive three tardies. 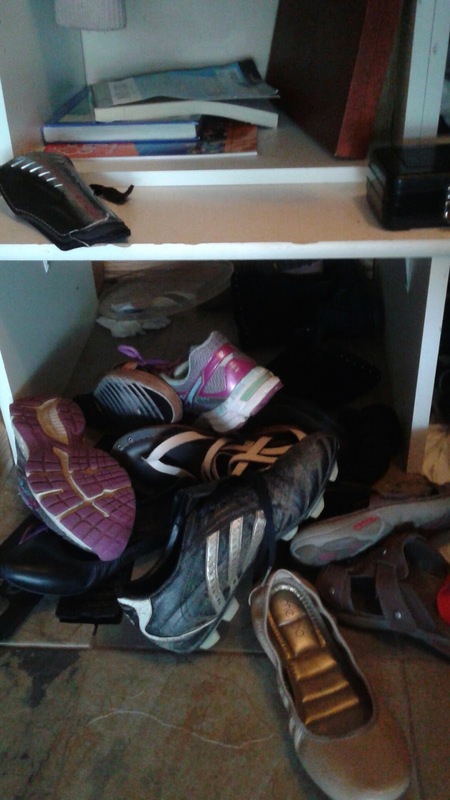 'Missing cleat' right in the middle of her mess of shoes. I had no problem with my kid serving a detention. Mini, on the other hand, burst into tears. She sobbed how this was my fault for not waking her up earlier. I reminded her that her missing soccer cleat had slowed her down - big time. When she panicked because she couldn't find it, I dug around in the mudroom to unearth it. I assumed the cleat sitting on top of the pile of shoes was the one that she already counted in her possession. Nope- that was the missing shoe. She had already packed the other shoe in her drawstring bag. She was mystified that I had found it. IT WAS ON TOP OF ALL OF HER OTHER SHOES IN FRONT OF HER LOCKER IN THE MUDROOM. The five plus minutes she spent searching for that shoe cost her. The next morning Coach was still home when the kids were preparing for school. I am usually too busy when I fly solo packing lunches, feeding faces, waking kids, settling disputes, and handling toddlers to police the length of the showers. With an extra adult on hand, I begged Coach to order Mini to bathe in a timely fashion. Magic. Mini appeared ready for breakfast in record time. Her dripping hair was wrapped up in the customary towel. It was a teaching moment. Mini CAN take a shower in under 25 minutes. Wonders never cease. Not sure if I need to thank the secretary for administering the long overdue detention or Coach for taking an active role in conserving our water supply . . . and my sanity. Back in the day, my own personal detention experience was awarded for true bad behavior . . . so being punished for tardy hardly seemed worth getting upset about. Stay tuned for me to share my rebellious streak in high school.